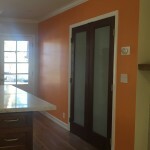 Space created by removing the old HUGE brick fireplace becomes a NEW coat closet in the hallway. 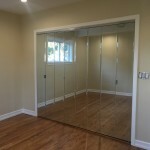 Bedroom closets had sliding mirrored doors. 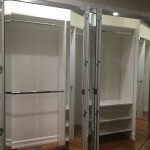 The mirrors help a small room look bigger and lighter, but you can only access ½ your clothing at a time. Replacing these doors with mirrored bi-folds will open access. As bi-fold doors take up floor space in the room we needed to adjust the framed door opening to clear the space for bedside tables. 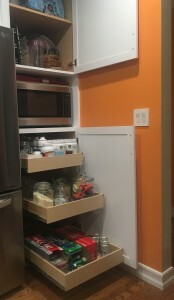 Full floor to ceiling pantry in the kitchen as well as additional pull-outs for full depth storage and easy access…YES!! 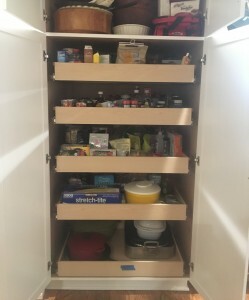 While living in an apartment 9/10 of a mile from the house and the Jana Design Interiors offices, we have become spoiled by the well-designed closet and pantry space.We will NOT miss the stacked parking and lack of ice maker, but the closets have been grand. The apartment is coincidentally also 1100 square feet. 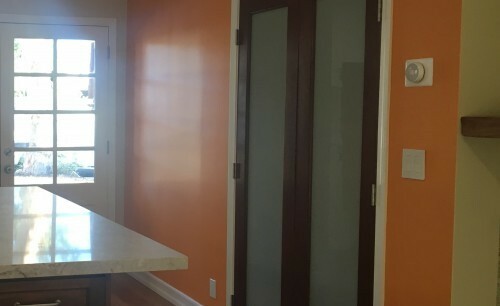 As it is in the neighborhood of California State University, Northridge (CSUN), the 2 bedrooms are really designed to be shared with up to 4- individual students. 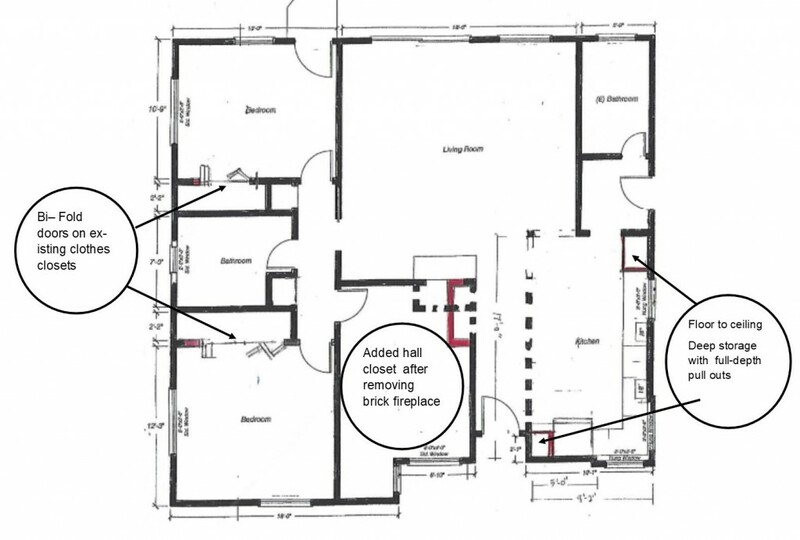 Each of the 2- large bedrooms have 3 large closets and there is a pantry closet to help make the tiny kitchen survivable. I also realize that we have spent the year living with ONLY what we instantaneously determined we would need for 6- months, which has become a year. The rest of our belongings were packed and moved into storage and we have little memory of what we had or why we had it. What we packed to live with included the normal 2-ish seasons of clothing, normal for LA, just enough cooking supplies and the bare minimum of sundries. The myriad of stuff we thought we needed and harbored in our closets, nooks and crannies, now, in hindsight, has questionable “need “in our lives. Clearly, as we thrived in 2017 without this huge truckload of stuff, we will need to make a lot of decisions when the stuff comes back to us. With this said, while every wall in the house needed repair, it was a good time to look for the adjustments we could make to incorporate improvements in our closet and storage. 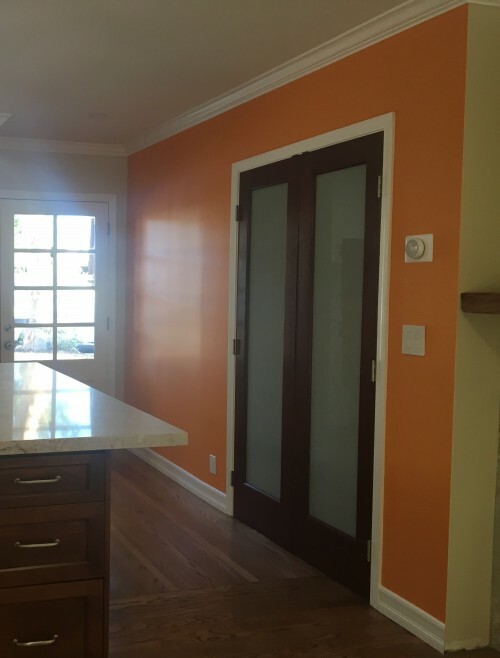 This is exactly what I look for to enhance my clients’ homes and businesses when we design renovations, and now I am eagerly applying all my well-honed talents to our home.